This utility will help you select the proper enclosure for the number and type of meters you will be housing by simply entering the quantity and type of meter. If we do not have an enclosure available for the combination you have requested, you will receive a message to that effect. You will be presented with a list of plastic, steel, and stainless steel enclosures that are available for the combination entered. Please call our sales department if you have any questions. Select which type of meter you will be installing into the enclosure. This is the type of meter that will fit into a vertical cutout enclosure. 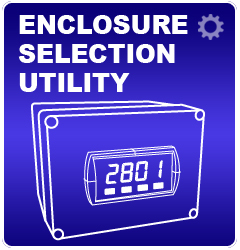 There is no need to select an annunciator for a dual orientation enclosure. You can view more details about a particular product by moving your mouse over tapping on the pictures below. You can view more details about this type of meter by moving your mouse over tapping on the picture below. Click on the Find the Right Enclosure button below to continue. Overall dimensions: 4.68" x 2.45" x 0.6"
Depth behind panel: 3.6" (91) not including clearance for wiring. Depth behind panel: 5.05" (128) not including clearance for wiring. Overall dimensions: 3.82" x 1.88" x 0.21"
Depth behind panel: 5.1" (130) not including clearance for wiring. Overall dimensions: 3.78" x 3.78" x 0.21"
Depth behind panel: 3.92" (99.6) not including clearance for wiring. Overall dimensions: 2.45" x 4.68" x 0.6"
Please select the type of meter you will be using. Finished assembly of these enclosures is done at the time of the order. As such, acknowledged orders are non-cancelable and the product is non-returnable.